I’m off to the city for my one-year anniversary with Jessie (yay!!) 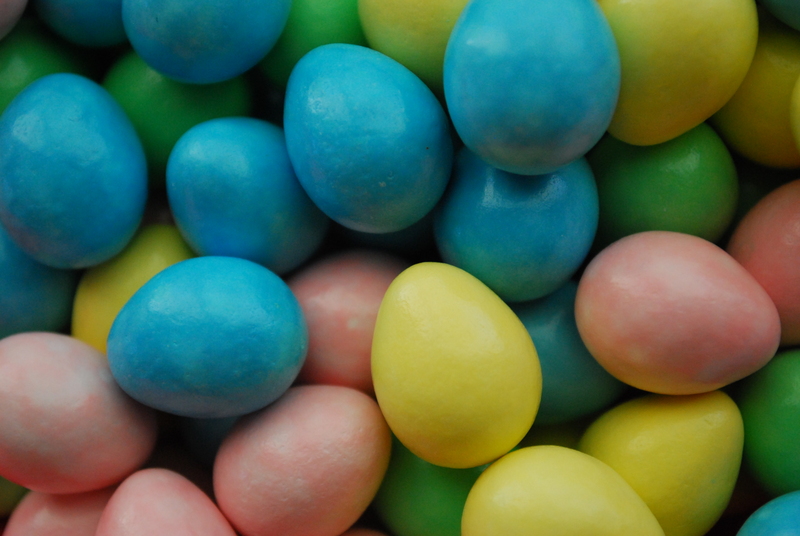 but before I leave (and inevitably change my outfit for the 14th time) I wanted to share with you a quick and easy Easter recipe I whipped up for a road-trip snack. 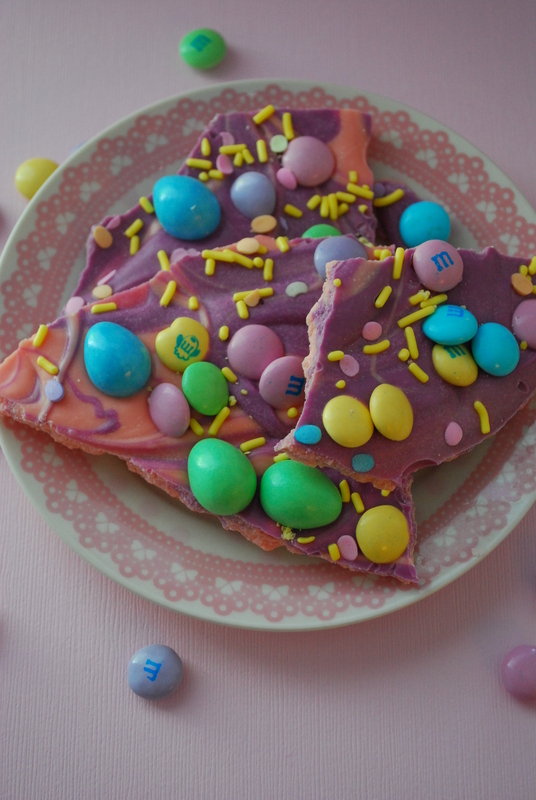 It’s Easter Egg Bark, and it’s totally pretty, easily wrappable and addictive, of course. I love making bark because of how easy it is–just melt some chocolate, spread it in the pan any thickness you like, and sprinkle your favorite nuts, chips or candies on top. It’s really that mindlessly simple. 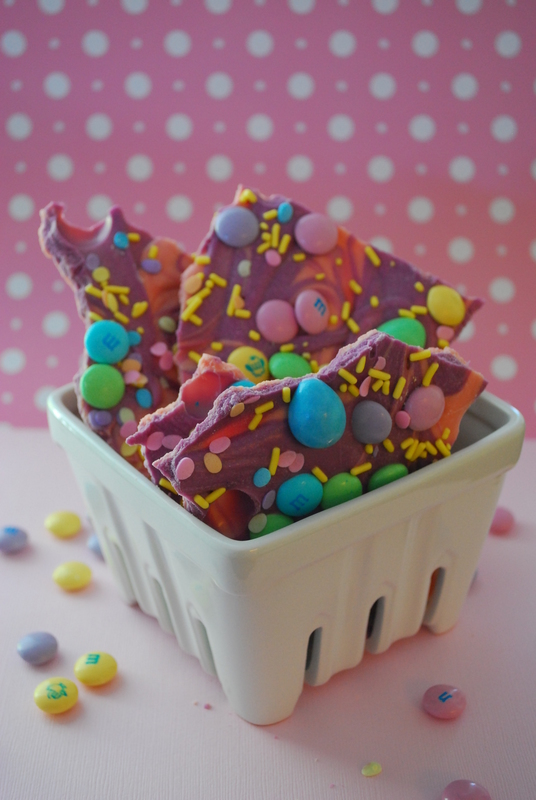 But this bark is special–it’s swirled pink & purple and topped with tons of Easter candy, so it’s pretty and festive for the upcoming holiday. 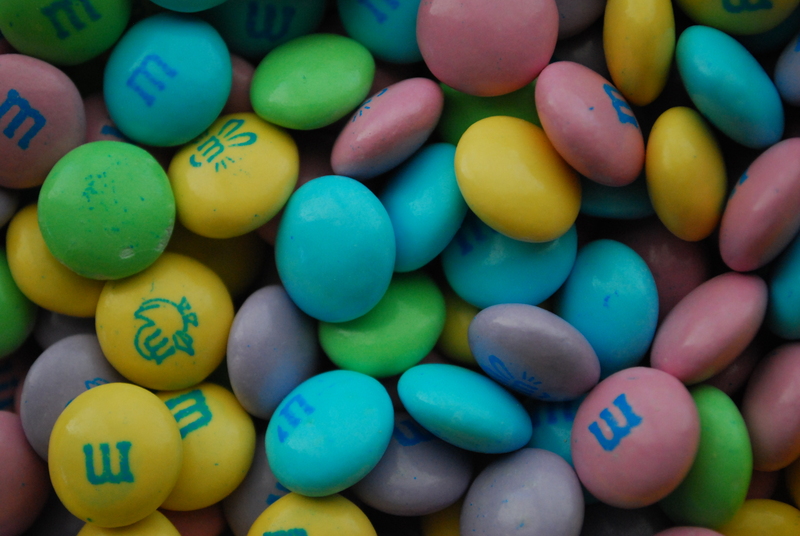 You could swirl any colors together you’d like, or top it with any candy of your choosing. 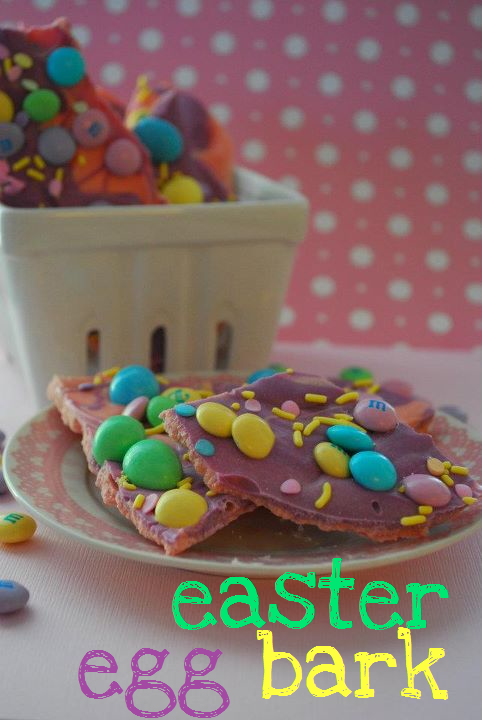 But for this, I used Reese’s Pieces Eggs and Easter M&M’s, as well as some Easter sprinkles I had on hand. Quick!! Whip this up now! 1. Start by foil-lining a rimmed baking sheet and setting it aside. In two large bowls, separately melt the chocolate melts according to color (pink in one bowl, purple in the other) until smooth & totally melted. 2. Drop heaping spoonfuls of each color side by side on the foil-lined baking sheet, spreading it to your desired thickness and shape. Using the tip of a butter knife, swirl the colors into each other to your favored look. I like it perfectly marbled between both colors. 3. 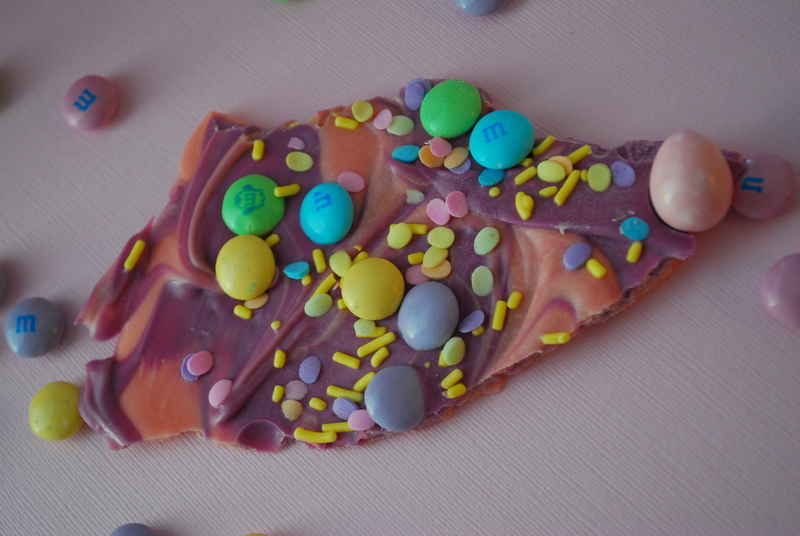 Once swirled, immediately sprinkle with the candies and sprinkles. Allow to harden, about an hour, before breaking the bark apart. Store this airtight for about 1-2 days. 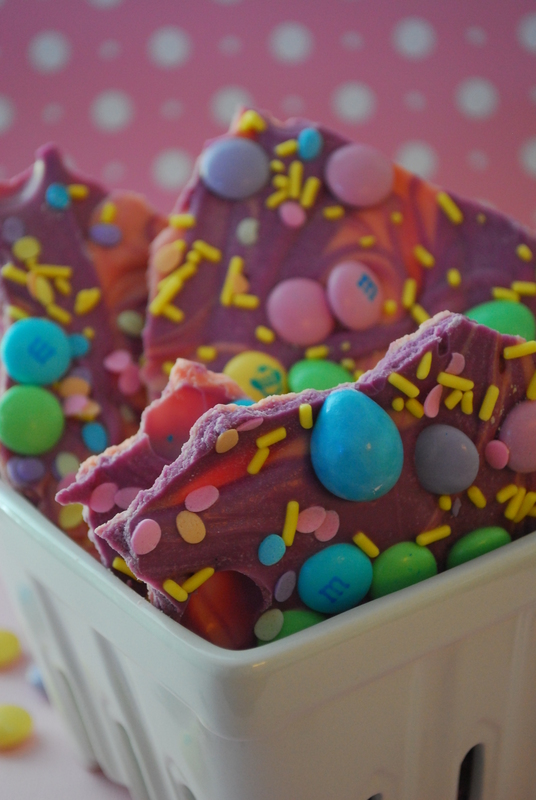 I love the marbled look of the pink & purple chocolate–it’s a great, inexpensive, impressive and easy way to make Easter candy for family and friends. And it makes a yummy road-trip snack!! I love the pink and purple swirls–my two favorite colors! This would be a fun project to make with the kiddo, though I have a feeling I’d end up eating the entire batch myself (I’m not much for sharing sweet stuff, if you get my drift!). 🙂 Have a great weekend! I bet it’d be super fun to make some bark with Doodle, even if you do eat it all 🙂 I’m sure he’d love swirling and sprinkling–hell, I did and I’m only supposed to enjoy these things marginally haha. Have a good weekend yourself!! Looks like I’m going to have to be the responsible-grown-up voice of reason in the group (since Dorothy was NO help :)! I think that covers everything. Happy anniversary!! Love this fun idea & the bright spring colors.